The other approach to take is to create new twists in the genre and rely on gameplay innovations to sell the game. 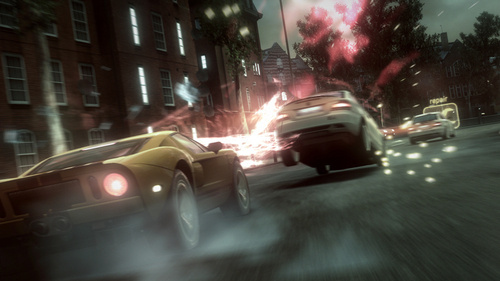 The Burnout series is perhaps the best example of this being done successfully – beyond the general car-wreck mechanics Criterion introduced, each title in the series has seen major gameplay changes when compared to the previous ones, which keeps the franchise fresh. Genuine ‘innovation’ in straight racing games is fairly hard to come by though so in this context we’re talking pretty much exclusively of the racing/combat hybrid genre. Blur definitely belongs to that genre, mixing the formula from Bizarre’s Project Gotham Racing games with the pickups and combat of Mario Kart. 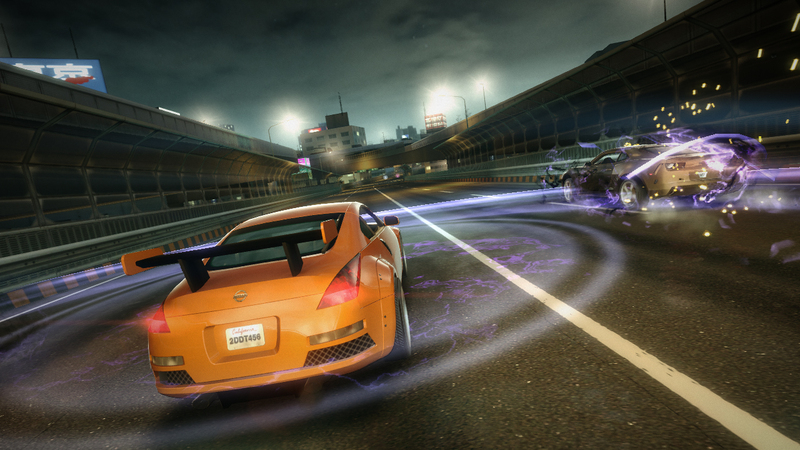 As a result the game is the first car-combat game to feature real cars or real locations. True to Bizarre, the car handling isn’t throw-about go-karting or arcade floaty-ness – it’s more nuanced than that. Your left trigger finger isn’t idle – there is a need for braking and, importantly, driving skill is valued over what power-ups you have or how well you can use them. Primarily this is a racing game, but the power-ups are needed to make your way through the pack and fend off others. Take away the power ups and Blur is, in theory, Bizarre’s Project Gotham Racing. The visuals seem to place the emphasis squarely on the power ups and their effects though, to the point of down-playing the many licensed cars and real-world locations and cities. Races take place almost exclusively at night or in the twilight hours, with city backdrops becoming curiously anonymous through the use – or rather lack – of lighting. The one exception to this is probably Brighton, where the pebble beach has been replaced with sand you can race along and the sky is permanently alive with fireworks. The cars themselves seem to have been muted too (both in character and sound), which is at odds with the varied and lively handling they have. This all comes together to give a deliberately slightly drab canvas onto which the luminous neon colours of the super-natural weaponry are liberally splashed. They spark, crackle and warp the screen, giving Blur a unique look and bringing to mind a 3D version of Bizarre’s Geometry Wars shooter. It’s a brilliant effect but when the firing ceases, the game can look and feel surprisingly pedestrian – fortunately that rarely happens. Bizarre jettisoned two tropes of the Mario Kart series – rubber banding and random, weighted pickups. By “random, weighted pickups” I’m referring to the way Mario Kart‘s fruit-machine inevitably gives the best weapons to those further back, again in an attempt to help them catch up. Both these characteristics are central to Mario Kart and often criticised for either being unfair and/or handicapping better players. It’s hard to argue with the first point when it comes to single player – blatant rubber banding simply feels like ‘the computer is cheating’, and the only recourse you have is to stop playing or put up with the frustration. Good AI – even rudimentary AI – should focus on making the game feel fair first, before making the opponent feel intelligent. On the other hand, distributing ‘random’ pickups to favour the racers further back is not only better for competition but, counter intuitively, seems fairer to the players. Why? In a fully random system it’s entirely possible that the racer in the lead might get a run of good items and at that point it doesn’t matter if the lead racer is player- or computer-controlled – for any players behind, having bad performance compounded by bad luck, it feels unfair and could be conducive to a rant or two from even the most good tempered loser. Instead, by having an obviously weighted distribution, everyone is aware (or quickly becomes aware through play) that there is a system in place and there is an implicit agreement between the players and the game to abide by this: as long as the computer keeps to this, the players won’t, for the most part, complain. Blur does away with this system by replacing it with something far more straightforward – pickups are shown and always in the same place for everyone. Want the ‘shunt’, the game’s homing missile? You just have to drive through the right icon when you see it. Since you can also carry up to 3 weapons and switch between them, there’s far greater scope for planning ahead and strategising. What makes this approach viable though is that none of the weapons are particularly over-powered when compared to each other. 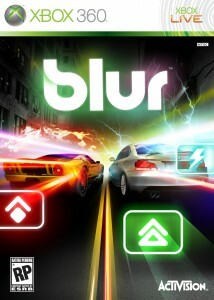 For example Blur‘s equivalent of Mario Kart‘s infamous blue shell is the lightning bolt, which drops a series of what are effectively speed bumps ahead of the lead player. Ploughing through them holds you up a bit more than driving around them but they are very avoidable – they’re just an extra challenge for the leader. Also since the obstacles stay for a little while, they affect any other racers near the front rather than just the leader, so there’s no incentive for suddenly giving up first place. Coming back to rubber banding, in Blur if it is present it is so light as to be almost unnoticeable – I certainly haven’t been able to decide one way or another if it is present. There is more of a justification for including it though, at least in multiplayer. To begin with, the idea of artificially helping players in multiplayer, particularly online multiplayer where the ‘purity’ of competition is often valued most highly, seems something akin to blasphemy. But with online racers that might have 8 players in, particularly with weapons involved, there are a few issues that could be remedied with a small amount of rubber banding. Firstly, in games like this the starting grid positions assigned are often random. Sometimes it’s according to points accumulated within a session but many people are often dropping in and out of a particular session so this is just rewarding whoever’s managed to stick with the group the longest. Once the race starts the grid can quickly segment into groups of two or three, with the back and forth of racers squabbling with those near them keeping rivals close together but often making it hard to focus on catching up with those in the group further ahead. If the groups get too far from each other along the track it becomes virtually impossible to escape your nearest rival without completely wrecking them (which in itself isn’t easy). Multiple branching race tracks can help alleviate this – racers can take a different branch to get some respite, regroup and focus on gaining speed. 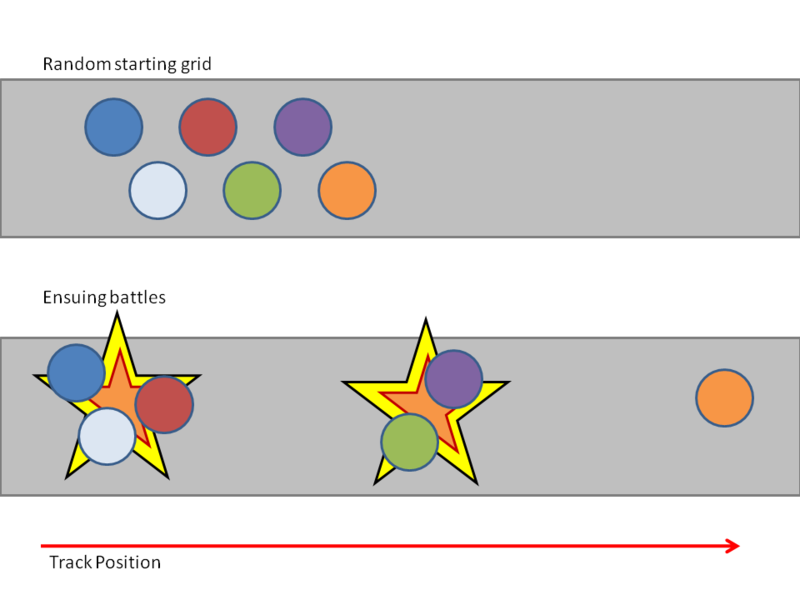 While this grouping phenomenon can make for fun battles, conversely it discourages close and fair competition since the benefits of each racer’s random initial starting position simply becomes magnified – in other words, it makes it much harder for the cars starting at the back to win, which is doubly unfair on someone who simply drew the short straw. A small amount of rubber banding though can ensure that groups don’t become too separated from each other, making it easier for racers to make progress through the positions and also stopping anyone from being stuck out on their own – online this can quickly make the game feel pointless. Secondly, accessibility is particularly important in online games that don’t have the benefit of a recognised name behind them. The likes of Halo or Call of Duty are always going to have a huge pool of online players of all abilities so that, no matter what you’re own level of expertise, it’s never hard to be matched up with people at a similar level. For any online game there is always the trepidation of being a rookie not knowing what to expect – if the experience is too dispiriting it’s all too easy to discount multiplayer and scuttle back to single-player, tail between your legs. With games like Blur that have a smaller audience, the players that stick with multiplayer, rather than going off to play the next racer or FPS-of-the-week, are going to be more dedicated. The experience then becomes more niche, the step-up for beginners becoming more off-putting. Rubber banding though can, at the very least, ensure that the cars at the back don’t get left too far behind – if they can at least see some of the players they are competing against while they learn the ropes, they can believe that improvement is, given time, within reach. Other games that aim for accessibility in multiplayer (I’m thinking of Nintendo’s notorious Mario Party series) can end up randomly bestowing points on players and succeed only in patronising them. It’s an important point to remember when considering ways of levelling the learning curve but, by and large, consistent and well thought rubber banding is not mutually exclusive with fair competition. 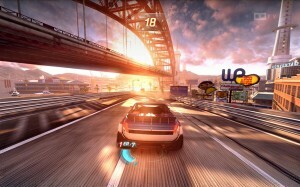 The game that Blur was consistently compared to was Split/Second: Velocity – Disney Interactive’s game that come out at roughly the same time – since they had many superficial similarities. Both were racing games with combat, from British development studios (Brighton’s Black Rock, in the case of Split/Second), new IPs and released at roughly the same time. Split/Second seemed to garner more hype and interest from critics before release and it’s not hard to see why. Aside from the novelty of a relatively new publisher muscling into a genre it hadn’t previously explored, the game’s premise was genuinely original rather than a hybrid Game-A-meets-Game-B. In Split/Second you’re racing in a game show that allows you to, in-race, trigger explosions, implosions, collapses, crashes and general disasters along the track scenery, in the hope of destroying or catching out your opponents. The game, by it’s very nature, is full of impressive set pieces to shock and surprise anyone playing for a short amount of time. For critics playing many games on the E3 show floor (for example) the games that can grab attention quickly are naturally going to gain ‘buzz’ as a result, so Split/Second generally got a positive reception in the lead up to being released. What was a little surprising though was hearing many industry commentators being dismissive of Blur directly as a result of previewing Split/Second. The final game certainly followed through on its promise of ‘wow’-moments – I can remember shouting an involuntary yelp the first time I was greeted by a jumbo jet crashing head on towards me. The ‘game show’ might provide a rather flimsy narrative pretense for constantly throwing spectacular explosions at you, but racing games have never had a need for story. Split/Second is constantly compared to a Michael Bay movie and like them, the experience quickly brushes away, or rather blows up, any need for coherence beyond the moment-to-moment sensations. Black Rock deliberately grasp this to provide a strong visual identity for the title, marrying the premise with the aesthetic – the Bay-isms come thick and fast. Helicopters are always whirring overhead, ready to drop more fire and smoke when necessary. The cars, unlicensed artist creations, are exaggerations of well known archetypes – the low-riding pickup, the mid-engined exotic, the classic muscle car. They’re never caricatures but the exaggeration makes them fit perfectly with the rest of the game’s hyper-reality. Then there’s the constant blurring sensation of speed; the screen is saturated in as much colour as possible; the scenery always seems bathed in the orange glow of a never-ending glorious sunset, interrupted only by the jarring screen-shakes of another near-miss explosion. In HD one of the things Split/Second really does well is bring home how important good artistic direction is, with or without technical achievement – I was surprised to find the game ran at 30 frames per second while seeming to fly by at break neck speed. When the two games came out, the general consensus seemed to be that they also cannibalised each others sales. Since both were new properties, the average consumer is going to have a hard time deciding which, if any, would be worth a punt on. In spite of the pre-release critical swing towards Split/Second, the two games ended up rating similarly well. This is probably because Split/Second‘s appeal waned somewhat with prolonged play, since the same set-pieces were bound to crop up again and lose their impact. Its driving model, closer to Burnout‘s knockabout, twitchy but simplistic fun, ends up putting closer scrutiny on those same set-pieces as well. Interestingly, the game’s own rubber-banding system came in for some criticism. Blur, focused more on competitive multiplayer, is in many ways a very different game that reveals some of its depth through prolonged play. Unfortunately Bizarre’s approach, coupled with a lack of publisher backing, didn’t bring enough sales to keep the studio alive.